Many small breed dog owners deal with a condition known as luxating patella (or floating kneecaps). One day their little pup is running blissfully around the back yard then out of nowhere they come up lame. There is usually a yelp and the affected leg rises into the air. It is heartbreaking, especially for someone who has never run into the problem before. Your next step is a trip to the veterinarian where you leave with a diagnosis of luxating patella. The truth is, it is somewhat common in small breeds such as Pomeranians, Chihuahuas, Malteses, and more. Many veterinarians actually diagnose it without the owner even knowing there is a problem. What is this problem? Luxating patella is a condition where a dog’s knee cap will slip out of its normal location in a groove formed by the bones of the legs. When this happens, the dog will come up lame and try to maneuver the knee cap back into groove. Grade 1 – The knee cap slips in and out of the groove, but returns to the normal position spontaneously. Grade 2 – The knee cap slips out of the groove occasionally and can be replaced with manipulation. Grade 3 – The knee cap slips out of the groove most of the time, but can be replaced with manipulation. Grade 4 – The knee cap slips out of the groove and cannot be replaced manually. Fortunately, grades 1, 2, and some of grade 3 respond favorably to chiropractic care, physical therapy, and more. Grade 4 may require surgery. However, every case benefits from joint protecting supplements! 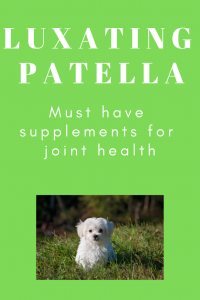 What are the best supplements for luxating patella and why? The problem with a knee cap that slides in and out is that it can rub against the joints and create inflammation. This leads to wear and tear, known as arthritis, that can become debilitating at a later age. To counter this, we need supplements to protect the joints. There are a number of supplements out there that contain glucosamine, an important joint protectant. However, they are often synthetic and aren’t easily absorbed by a dog’s body. Instead look for more holistic options such as the products we review below! Joint supplements featuring Green lipped mussel are excellent for countering the joint damage of luxating patella. They feature healthy omega 3 fatty acids in conjunction with glucosamine and chondroitin (key building blocks of joints and cartilage). Super Snouts has a highly reviewed product that works well. Wholistic is a great brand that features many great supplements. 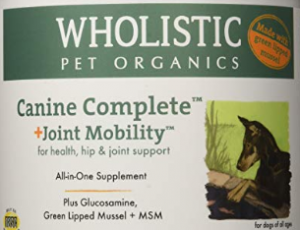 Their Canine Complete Joint Mobility supplement features glucosamine, chondroitin, MSM, green lipped mussel, and adds other vitamins and minerals to boost your pups overall health. 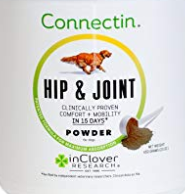 InClover Connectin also offers a joint supplement with a proprietary blend that features additional herbs with anti-inflammatory properties. Green lipped mussel is not present in this product. However, it does pack quite the punch with the addition of numerous herbs. 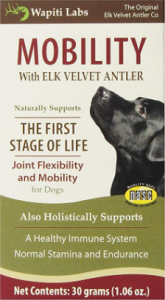 Another holistic joint supplement we see a lot features deer antler velvet. Deer shed their antlers every year, which contain a ton of nutrients. Antlers are one of the fastest growing tissues in the animal world and have impressive regenerative capabilities. The velvet is processed and turned into a dietary supplement for your dog. Wapiti Labs has a whole line that you can check out for your dog! As you can see, there are many options. When it comes to finding the right supplements for luxating patella, you want to focus on quality. Many of the ones we listed are great examples, but they are far from the only options available. You can certainly browse for other options, but definitely search for some of the ingredients we mention. Luxating patella is certainly a troublesome condition. However, starting supplementation at the earliest signs can help protect the joints over a lifetime! *In an effort to be completely transparent, we do receive a commission if you purchase any of the products. Doing so allows us to continue producing content like this to help pet owners. However, there are many great products out there in addition to what we list in this article. Feel free to explore other options.